University of Nottingham > Blogs > INNOVATE - Novel Aerospace Technologies > Additive manufacturing > Can we “3D-Print” an Electric Motor? Can we “3D-Print” an Electric Motor? The well-established success of the Rapid Prototyping technologies derives from the possibility of creating parts with almost any shape at no added costs. However, in order for a part to be functional (i.e., with good mechanical properties), high density and tailored material properties are desired. 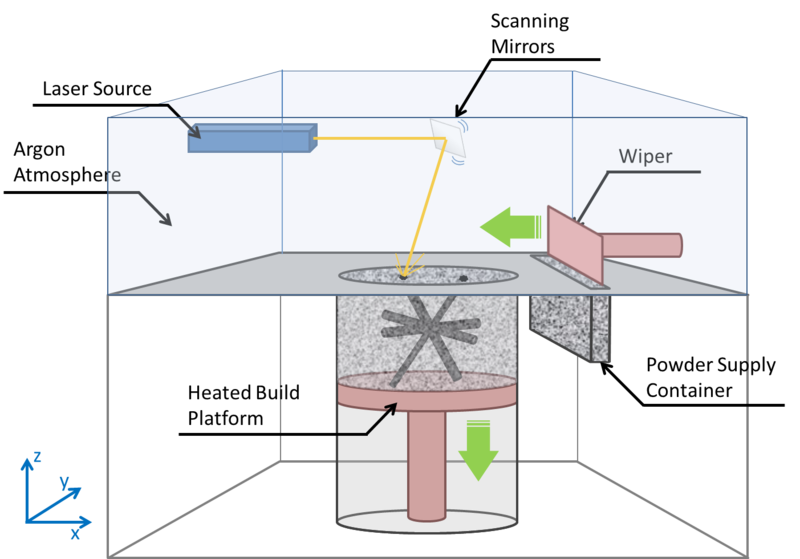 In the past few years, Additive Manufacturing (AM) technologies such as Selective Laser Melting (SLM, shown in Fig. 1) have been proving more valuable than Rapid Prototyping in that they can achieve densities comparable to those obtained through classical subtractive and formative processes. Thus, AM is showing great potential for moving from Rapid Prototyping to Rapid Manufacturing. For this reason, SLM is emerging across a broad range of sectors, including automotive, medical and aerospace, for the creation of functional parts. It is of public domain that one of the most prominent aerospace names regularly associated with AM is GE Aviation, which already in 2013 was leading the way with its plans to produce a fuel nozzle using SLM. A little more than two years have gone by, and GE best-selling engine of all times (the LEAP engine) is set to enter into production by end 2015. Indeed, it will feature the 3D-Printed fuel nozzles that have been making the headlines in 2013. Despite the use of AM and SLM in a range of metallic materials, including Stainless and Carbon Steels, and a few Titanium, Cobalt and Aluminum alloys, the potential of this manufacturing technology for functionalities other thanpurely structural seems pretty much unexplored. A significant example in this regard is represented by those materials with ferromagnetic properties, such assoft and permanent magnets. Applications that rely upon such materials include the large family of devices that transform electrical energy into mechanical energy, such as loudspeakers and motors, and from mechanical to electrical, such as microphones and AC generators. Until now the design of standard magnetic devices has not gone much beyond the two-dimensions, especially due to constraints imposed by the (mainly subtractive and formative) manufacturing processes employed. Arguably, this imposes limitations in terms of the performance, let this be of acoustic or electromechanical nature, or in terms of the weight. A very interesting example is that of electrical motors, whose application to the transportation industry is seen as the most promising alternative to fossil fuel engines and mechanical actuators to cut the emissions of green-house gases and thus limit the impact on the environment. The possibility offered by AM to extend the design of components to three-dimensional space without the constraints of traditional manufacturing introduces new opportunities towards the production of highly power-dense electrical machines, where the core magnetic material is added only where it is actually needed. The impact of such innovative devices would be highly beneficialespecially for transport applications, where weight is the primary determinant of vehicle efficiency. Modern Permanent Magnet machines for transport applications rely upon two types of ferromagnetic materials for energy conversion: soft magnets and hard – or permanent – magnets. The alloys belonging to the former type have the property of magnetising when immersed in a magnetic field, and lose their magnetisation upon field removal. Hence, soft magnets are used to ”amplify” and guide the magnetic field through space. Both the stator and the rotor cores of electrical machines are soft magnetic. Among the most popular soft magnetic materials, we find Silicon Steel, Cobalt Steel, the Nickel-Iron family of alloys (a.k.a., Permalloys), and a class of soft magnetic ceramics (soft Ferrites). On the other hand, permanent magnets retain their magnetisation in the absence of a magnetic field, therefore effectively producing their own magnetic field. Materials with permanent magnetic properties are a class of Iron ceramics (hard Ferrites) and, most importantly, the family of alloys based on the rare-earth minerals Samarium and Neodymium. The latter are a major concern for western producers across a broad range of hi-tech industries, due to their limited availability outside of China, which effectively controls the worldwide distribution by producing over 90% of global rare-earth minerals needs. Being able to minimise the need for rare-earth material by optimising the shape of the magnets, by exploring substitutes (e.g., hard Ferrites), or even through recycle and reuse of old magnets are all very attractive options, which a technology like AM could enable. The idea of processing electrical machines using laser-based additive technologies has been around for at least one year now , when an article appeared on the blog of the CAFE Foundation (link here) presented the $2.7 million project ”Additive Manufacturing of Optimized Ultra-High Efficiency Electric Machines”, which the Connecticut-based United Technologies Research Centre will be launching in early 2016. However, the project targets the direct manufacturing of copper and insulation, layer-by-layer, as opposed to the traditional wire winding technique. By optimising the placement of the electrically conducting material, the team hopes to be able to minimise the quantity of core magnetic material within the device. But what about the possibility of printing the magnetic material itself into soft and permanent magnets? On the permanent magnet front, the Critical Materials Institute (CMI) in Ames, Iowa, has been established by the US Advanced Manufacturing Office with the purpose of overcoming the shortage of critical materials (link here). As part of this mission, the CMI is addressing the opportunity offered by AM to process high-performance permanent magnets without needing estensive use of rare-earths. As regards to the soft magnetic materials, the potential for improvement through AM seems pretty much unexplored, as testifies the complete absence of coverage in the media. As part of the EC-funded, €3.8 million programme INNOVATE (more info about the programme here), the IAT and the Additive Manufacturing and 3D-Printing Research Group at the University of Nottingham are working on a project aimed at investigating the very potential of soft magnetic material development through SLM for rotating electrical machinery applications. At the More Electric Aircraft Conference in Toulouse earlier this year (manuscript can be found here), we presented the idea that the Synchronous Reluctance rotor (Figure 2) could be the good candidate for processing using SLM. The rotor of this machine is characterised by a very simple structure, composed entirely of soft magnetic material. Neither conducting material (e.g., the copper/aluminium bars used in Squirrel Cage Induction Machines) nor permanent magnets are involved. 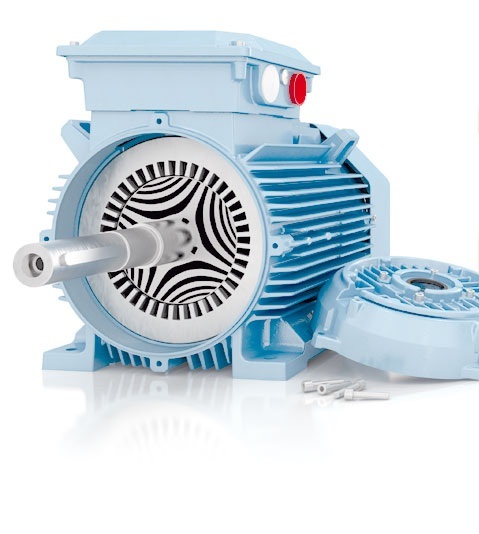 Therefore, the performance of the Syncronous Reluctance Motor mainly relies on rotor core geometry and the capability of the material to conduct magnetic flux. Furthermore, as the Synchronous Reluctance Motor operates at synchronous speeds, the rotor flux variation is minimal and its fabrication as a solid structure can be envisaged without incurring in detrimental eddy current losses. 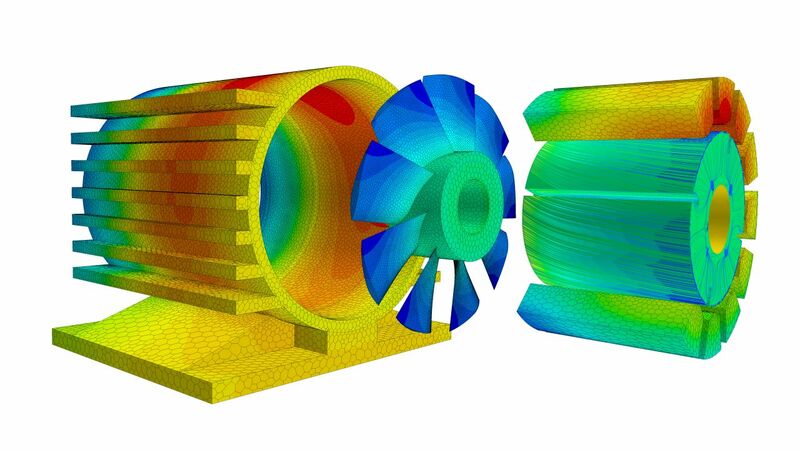 The employment of AM/SLM, alongside advanced design tools like Topology Optimisation, may enable the creation of innovative three-dimensional designs for reluctance rotor structures that are free from the constraints of classical manufacturing. Improvements might include the conception of continously skewed rotors and unconventional saliencies/flux barrier designs. But the advantages of SLM are not restricted to geometrical considerations. As an example, soft magnetic Silicon Iron alloys represent excellent candidates for processing using SLM. In particular, SLM might foster the employment of 6.5%Si steels, which are known for their good magnetic properties such as high permeability, low hysteresis losses, high electrical resistivity, and low magnetostriction. The commercial application of these alloys has been limited due to their poor ductility, which makes their processing difficult. Owing to the powder-based, layer manufacturing approach of SLM, the employment of 6.5%Si steels for machine cores can now be envisaged indeed. 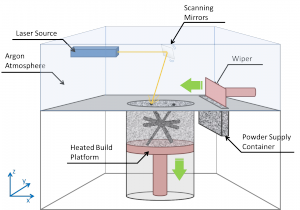 Given all of these premises, and seen the success that laser- and electron-based AM technologies have recently deserved for structural applications, it is safe to claim we won’t have to wait too long before witnessing the world of electromagnetics benefiting from the ground-breaking manufacturing technology of the digital era.